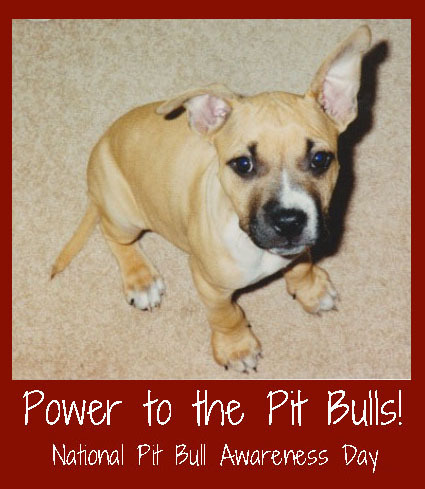 NPBAD was started in 2007 by Jodi Preis of Bless the Bullys, a small, non-profit rescue organization in Tennessee, as a way to bring much-needed positive media attention to this often maligned — and banned — breed. Pit Bulls (along with Doberman Pinschers and Rottweilers) are frequently the victims of breed-specific legislation (BSL), laws that single out a particular breed instead of placing responsibility on dog owners. Because it is so unfair — not to mention ineffective in increasing public safety — BSL is opposed by virtually all major animal welfare organizations, including the ASPCA, AVMA, HSUS, et cetera, et cetera, et cetera. The most decorated U.S. military dog in history was a Pit Bull mix named Sgt. Stubby. Sadly, Stubby would be banned from U.S. military bases today because of his breed. A Pit Bull named Popsicle (he was found abandoned in a freezer) became a narcotics-sniffing dog and made the biggest single drug bust in Texas history: 3,000 pounds of cocaine. Really cool celebrities like Jon Stewart and Kevin Bacon are proud pet parents of Pit Bulls. For your reading pleasure, here are a bunch of positive stories about Pit Bulls.